TYWKIWDBI ("Tai-Wiki-Widbee"): "It's raining worms." Again. Pupils at a Scots school had to run for cover when it started raining worms during their PE lesson. Teacher David Crichton was leading a group of pupils playing football on an astroturf pitch at Galashiels Academy when dozens of the slimy creatures began plummeting from the sky. David said the children had just completed their warm up when they began to hear "soft thudding" on the ground. The class then looked to the cloudless sky and saw worms falling on to them..."Then they just kept coming down. The kids were laughing but some were covering their heads and others were running for cover for a while. They just scattered to get out of the way.".. "I spoke with the science department here but none of them had any explanation for it. One of them thought maybe it was a freak weather thing. But it was such a clear, calm day. And we are quite a bit away from any of the buildings so it's not like anyone could have been throwing them.”..
Showers of worms falling from the heavens have been reported in the past. In 1872 worms were reported falling in Somerville, Massachusetts, in 1877 in Christiana, Norway, and in 1924 in Halmstad, Sweden. 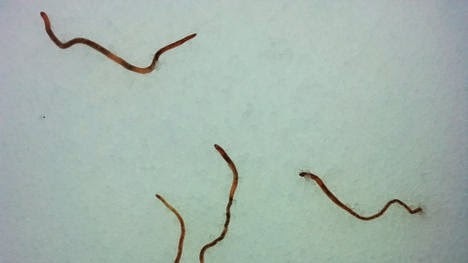 More recently, in July 2007, a woman was crossing a road in Jennings, Louisiana, on her way to work when large clumps of tangled worms dropped down from above. That incident is believed to have been caused by freak weather over a nearby river lifting water and worms and dumping it over the road. Plenty of witnesses, and the Astroturf precludes mistaking worms emerging from the ground. Depending on the geography, the worms still could have been catapulted or sling-shotted from a distance as a prank. But it does seem likely that a whirlwind lifted the worms from the ground and carried them away. I wonder what happens to all the other debris that would have been pulled up; do whirlwinds and turbulence sort things by weight as a sort of giant centrifuge? Reposted from April 2011 to add this a recent similar event in Norway. Biology teacher Karstein Erstad was out for a ski in the mountains outside Bergen on Sunday when he came across the unusual phenomenon. Since Erstad’s discovery was reported in Norway’s NRK news channel, corroborating reports have flooded in from across southern Norway, with sightings of worm rainfall in Lindås and Suldal near Bergen, and as far away as Femunden on the Swedish border. Via Nothing to do with Arbroath (again! ), and again it hasn't been noticed in the Fortean Times, where the story truly belongs. I continue to be fascinated by these events, especially by the apparent "sorting" phenomenon that nature performs, because certainly a wide variety of other debris would have been elevated by whatever weather phenomenon removed the worms from the ground. I can only imagine that items suspended in a column of turbulent air must get grouped by their aerodynamic properties or by their weight in a sort of immense chromatography column. Related: the Wikipedia link for Rain of animals. The Thread! Pern is real, I knew it! I love Mel V.'s comment. What we need is agenothree, some dragons and fearless riders. Good call Mel. Yeah, but grubs do much better work at dealing with that! "Rain, in Wormworld, means two things: Mating and bathtime, both of which were immensely enjoyable for the worms." I've always wondered about the rains of worms and fishes. I have heard that the explaination for fish rains have been waterspourts in watery areas, mainly lakes and inlet bays, but this is truely puzzling, since if it is raining earthworms, then what happens to the rest of the debris? And bravo to you Mel V., that was an excellent Pern reference. I shouldn't be surprised to find Pern lovers here. Count me in, too. The "whirlwind" explanation for such things falling out of clear blue skies (fishes, frogs, worms...) has no basis in fact. It is just a speculation that long ago gained traction. It satisfied the status quo, so they could sweep the whole issue under the rug. But I challenge anyone to prove this speculation has any merit, other than to pretend that something is explained, when in reality it is just an example of "scientists" puffing out their chests, pulling something out from where the Sun don't shine and passing it off as science with bomfoggery instead of proof. CloudSampson is correct: It is an enigma, though I prefer the term "anomaly." Science doesn't do well with anomalies; they make scientists butts pucker up.